“All Nighter” (2017) is a MOVIE. ORIGINAL – it is not a remake, re-imagining, reboot – or sequel, prequel or whatever. It has no comic-book characters, video-art, SFX and aside from one well-timed punch in the face, no action. 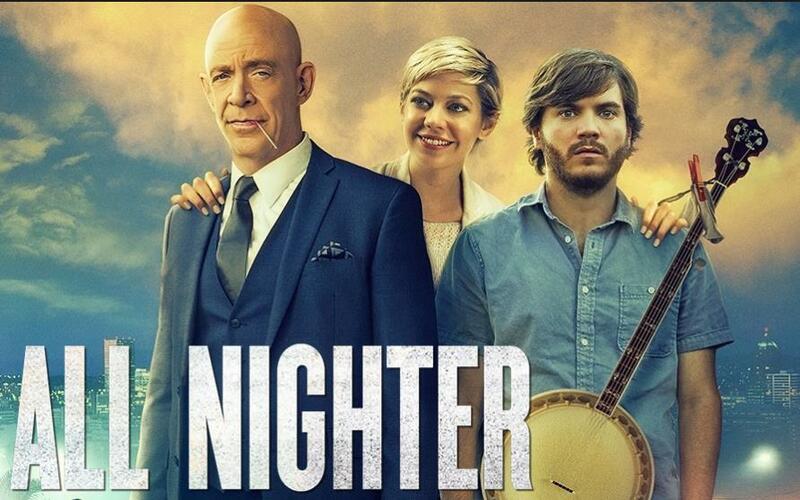 But what it does have is a PLOT, CHARACTERS – and J.K. Simmons. And he has charisma, style, that voice and that FACE. It is HE who drives this film. An odd-couple piece, where a busy businessman who has lost contact with his daughter teams up with her dopey ex-boyfriend to try to locate her (Simmons is the businessman). Simple enough – and this would only be a time-passer, were it not for J.K.
At one point, a young girl describes him as “do-able” – a sentiment I can live with, given he is only two years younger than me and has the same hairstyle (none). Plus, he is one HELL of an actor. Of course, this indy movie has made no money at all – being ABOUT something – and one wonders how much longer such films will continue to be made. The answer is likely – not long. So check out this gem while you still CAN.